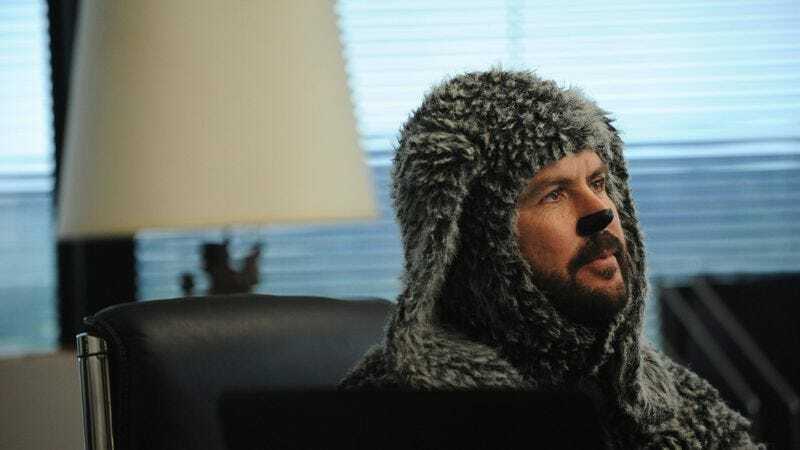 Wilfred (FXX, 10 p.m.): After three seasons of an increasingly tenuous grasp on sanity, Wilfred will come to an end after these next 10 episodes. We’re kind of hoping the show doesn’t try to provide “answers” but, instead, just goes in for wild mind-fuckery to the very end. Then again, maybe that would be just as disappointing. Rowan Kaiser is hoping that he’ll get to follow coverage of this show up with a show where Sean Astin is helped through his personal crises by a beautiful woman in a goldfish suit. And if you think that sounds like a good show, he’s got a pilot script all ready to go. So You Think You Can Dance (Fox, 8 p.m.): Can it be called regular coverage if we’re just dropping in every few weeks? It can now! Oliver Sava stops in for callbacks, which aren’t in Vegas for the first time ever. So where will they be held? We’re crossing our fingers for Shreveport! Lost (1 p.m.): This week, Todd VanDerWerff digs into the first Jack flashback, which should really be called a flashJack or, possibly, a Jackback, or maybe Jack attack. He’ll also check out what’s up with Sun, then announce who’s taking over once he leaves us all for other climes at the end of the week. “Just one more thing,” says Gwen Ihnat, and that’s all the introduction you need for the latest subject of a TV Club 10 installment. Yes, we’ve finally gotten around to dissecting Columbo in this space, and Gwen will prove why Peter Falk deserves to be on the list of the greatest TV detectives of all time. At this point, you likely have your feelings about the Tournament Of Episodes all figured out, but we’d urge you to read Erik Adams’ take on Breaking Bad versus Community before jumping to any conclusions. We guarantee some excitement. Just because Game Of Thrones isn’t on right now doesn’t mean you can’t get some of the same flavor from other pop culture—including some other TV shows. That’s why we’ve done this Inventory of other entertainments you can use to fill the Game Of Thrones-shaped hole in your life. We’ve got some TV Reviews for you, too, led by Erik Adams’ earnest appraisal of Girl Meets World. It’s the review he was born to write, baby! We think you’ll agree with him that all shows should be sequels to mid ‘90s TGIF programs. Big Brother (CBS, 8 p.m.): Yep, this still exists and is a thing you will hear entirely too much about in the weeks to come. Not here, though! Young & Hungry/Mystery Girls (ABC Family, 8 p.m.): Genevieve Valentine had thoughts on these two new sitcoms back on Monday. Sadly, it doesn’t sound like either is completely worth it. We would have bet anything a series starring Tori Spelling and Jennie Garth would be amazing! Million Dollar Listing: Miami (Bravo, 9 p.m.): Wake us when Bravo gets to One Hundred Thousand Dollar Listing: Des Moines! Taxi Brooklyn (NBC, 10 p.m.): Sonia Saraiya found this new series to be surprisingly enjoyable, even if it’s a fairly standard procedural. Then again, she’s probably being paid off by Big Chyler Leigh lobbyists. The Wolverine (HBO, 9 p.m.): We thought this X-Men spinoff was a damn sight better than the first Wolverine movie. Then again, that wouldn’t have been very difficult, so that may seem like damning with faint praise. Instead, we’ll say we found this engaging and entertaining, in and of itself. MLB Baseball: Tigers at Rangers (ESPN2, 8 p.m.): The Tigers opened up with a roaring start but have cooled off a little since then, while the Rangers haven’t managed to get much of anything together just yet. Still, you never know when it comes to America’s pastime.